Start your genealogy research in Salerno province. Here is a list of all the towns in province of Salerno. If you know your ancestors were from one of these towns, let us know by filling the contact form below. Esposito, Russo, Giordano, Senatore, Pepe, Ferrara, Coppola, Ruggiero, Gallo, Marino, Romano, Apicella, Sorrentino, Vitale, De Rosa, Grimaldi, Amato, Lamberti, Landi, Pagano, Manzo, Santoro, Rizzo, Bruno, D’Angelo, Sica, Greco, Sessa, Palumbo, Tortora, Napoli, D’Amato, Ferraioli, Annunziata, Vitolo, Cirillo, Alfano, Senatore, Caputo, Iannone, Volpe, Pellegrino, Califano, Trotta, Cuomo, D’Ambrosio, De Martino, Avallone. Found your family name in the list? 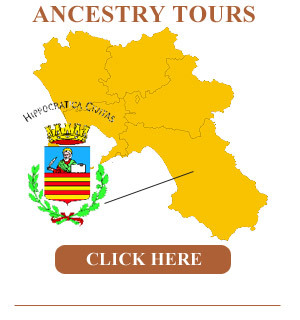 Contact us to find out more about your family history in province of Salerno. We can help you start your genealogy research in Salerno and even arrange your trip to Italy to visit your ancestors’ town and places where they grew up. Get your family history back and visit beautiful places with the help of our local guide.